YMER&MALTA / nendo, Light Fragments. Acrylic, metal, LED. Valérie Maltaverne, an auteur imbued with French “savior-faire,” founded YMER&MALTA in 2009 as a design laboratory. Maltaverne, a devotee of France’s centuries-old luxury crafts, decided to apply her creative interest and sensibilities to reimagine these industries by marrying traditional materials with cutting-edge technologies. The present project – the exhibition “Akari Unfolded” –the first outside of French craft, posed a particular challenge. Could treating Akari’s fundamental elements what Isamu Noguchi called the intrinsic qualities of craft that cannot be successfully duplicated (for example, Akari knockoffs) be thrust into the future? Maltaverne encourages designers “to project and express opinions, find solutions, and do the impossible,” went on to select six designers: two industrial, the British Sebastian Bergne and the American Stephen Burke; Océane Delain who specializes in digital fabrication, YMER&MALTA designer Benjamin Graindorge, the Japanese firm nendo, and artist, historian, Sylvain Rieu-Piquet. You are an avid collector of Akari lamps. How did this passion come about? I lived across the street from The Steph Simon Gallery in Paris one of the more highly regarded Akari retailers best known for introducing and championing the designs of Jean Prouve and Charlotte Perriand. I bought Akari from the gallery living with them for many years developing a special relationship and sensitivity to its intrinsic qualities that has stayed with me overtime. Thanks to Simon, Akari had a strong impact on French design. How did you and The Noguchi Museum connect? Through YMER&MALTA collections we have proven to infuse new life into century-old French materials such as marble, leather or marquetry and at the same time bring them to contemporaneity in timeless designs by incorporating new technologies into the production process. Over time our work attracted the attention of museums and institutions among them The Noguchi Museum, who, in 2016 invited YMER&MALTA to develop a lamp collection inspired by Isamu Noguchi’s Akari. There is a special energy of warmth and simplicity in The Noguchi Museum which I identify with and that left us extremely comfortable and inspired to create each piece. I had a very pleasant connection to Dakin Hart, the senior curator throughout the whole process. For instance, at the beginning we intended to make six projects, but when Dakin came up with the name for the collection “Akari Unfolded” I had an insight to unfold each original design into small families. We ended up using six designers (each of whom created multiple prototypes), and artisans in more than 20 different disciplines. Overcoming many technical hurdles, we pushed linen, metal, resin, Plexiglas, concrete, and paper in new directions for a total of 26 pieces. 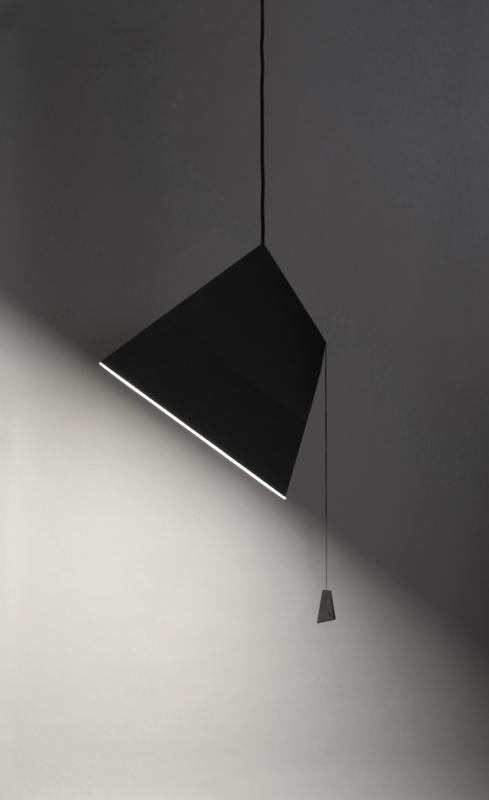 YMER&MALTA / Sebastian Bergne’s Poise lamp. Paper, metal, LED. The designers’ prototypes remarkablably capture the essence, in different ways, of Noguchi’s values. How were they selected? At YMER&MALTA we have a very particular working process. In my previous career as a film producer, I developed a collaborative methodology in which I orchestrate an intense exchange between the designers and myself in the creation phase and with the artisans in the production phase. The designers were selected based on the concept and who could adapt to the spirit of the project and with whom I could create a cohesive collection. Other than that we keep a familiar environment so the exchange made throughout the design process flows nearly uninterrupted. Of course, we must have a good personal connection. Was there a set criteria? Since we had a close working relationship from the outset, I guided them into designing pieces that would pay particular attention to Timelessness and Harmony both the industrial and the natural as being the soul of the home. This needed to be realized within an architectural framework. YMER&MALTA is a cross between an artisan workshop and collective risk-taking enterprise with high tech in the mix. Could you give an example of your methodology? The first inspiration for Belle du Jour came from a photo I took on a trip to Corsica. From the image of a mountain with multi-rock layers, Océane [Delain] made several drawings. And we then entered in an extensive 3D printing and paper laser cutting prototyping process until we achieved the final design. To make a connection to bamboo used in the Akari, I chose to work with linen which would be the French equivalent. Achieving the sheet’s necessary rigidity, color and diffusing properties required making several samples. The linen and resin chosen form a composite sheet that is at the same time strong, thin and translucent. They result in the perfect balance between a soft translucency and mechanical performance.The volumes of each lamp are collapsible similar to the Akari lamp, but we use a different technique. Belle de Jour comprehends a sconce, a corner lamp and a floor lamp. Are the lamps being sold commercially? We are still in the research phase and hope to have them available soon. Akari Unfolded: A Collection By YMER&MALTA is a parallel exhibition to Sculpture By Other Means a reexamination of the Akari lamp over the decades. On view at The Noguchi Museum through January 27, 2019.